Tombs of the Sa Huynh civilization of more than 2,000 years ago have been dug up in Tre village in Tay Tra district, in the central province of Quang Ngai. The tombs were unearthed at a depth of 1 meter. The site is only 2-5m from the bank of Tang River, around 5km from a famous archaeological site in the Tang River valley. Dr. Doan Ngoc Khoi, from the Quang Ngai Museum, said the tombs are located close together. Archaeologists have worked for over two months on Tang riverbed. They unearthed a prehistoric archeological site which can shed new light on an ancient civilization that once flourished in Quang Ngai province. In a part of the river where water was dried up to build a water reservoir for a nearby dam, they excavated tools that date back to 4,000 years ago. The tools could have been used in daily life and in production activities. 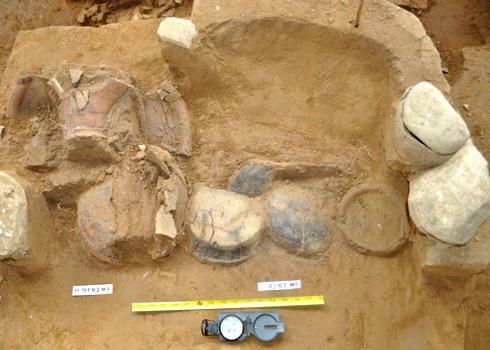 Along the river, the team also dug up pottery products belonging to a pre-Sa Huynh period and buried jars containing items typical of the Bronze Age’s Sa Huynh culture, which dates roughly to 1,000 BC-200 AD. Another important finding was that stone tools belonging to the Neolithic Era (prior to Sa Huynh culture) discovered in the Tang river valley are actually similar to what was previously found in the Central Highlands. Khoi said that it was possible that the New Stone Age tribesmen had crossed over the Truong Son mountain range, and reached the coastal delta of Vietnam’s central region. Their migration had laid foundations for the development of Sa Huynh civilization in the following Bronze Age era when the use of early bronze tools appeared in the central and southern provinces of Vietnam. However, a water reservoir will be constructed right at the archeological site to serve a nearby dam, which could endanger other unfound artifacts. The first priority is to find a way to evacuate all the findings out of the area before it is flooded, Doctor Doan Ngoc Khoi said. The Ministry of Culture, Sports and Tourism previously permitted archaeological excavation at the Tang river valley until May 15. However, the Ministry of Agriculture and Rural Development (MARD) on March 30 asked the Quang Ngai authorities to start the construction of the dam on April 5. The Quang Ngai Department of Culture, Sports and Tourism asked Quang Ngai authorities to negotiate with the MARD to postpone the project until the archaeological project is complete. “If the MARD decides to implement the project as of April 5, the entire archaeological site will be flooded,” Dr. Khoi said. Sa Huynh Culture is a jar burial culture on the coastal plains of central and southern Vietnam, which boasts a distinctive decorative style of bronze axes, daggers, and ornaments.